And then I saw THIS abomination! 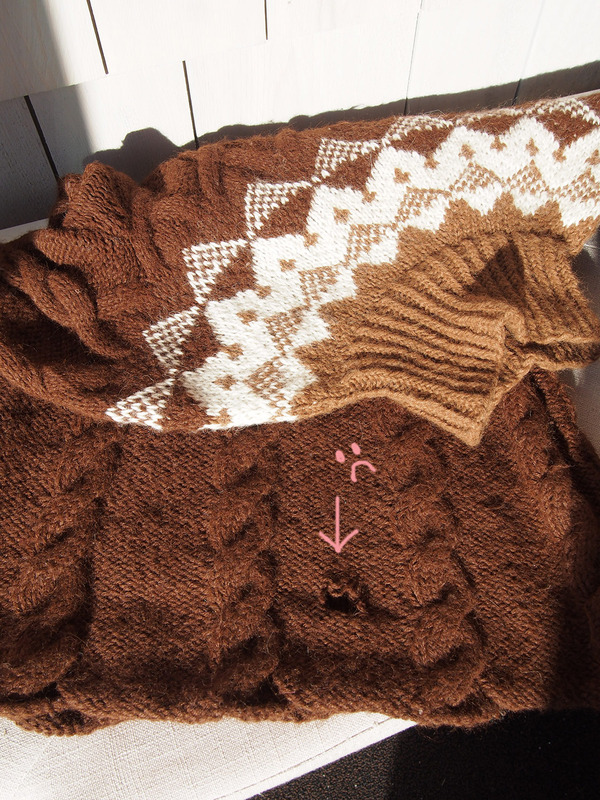 The sweater was made with 100% luxury-meal-for-moths alpaca (bought in Santiago, Chile) and there was a gigantic very NOT friendly hole. 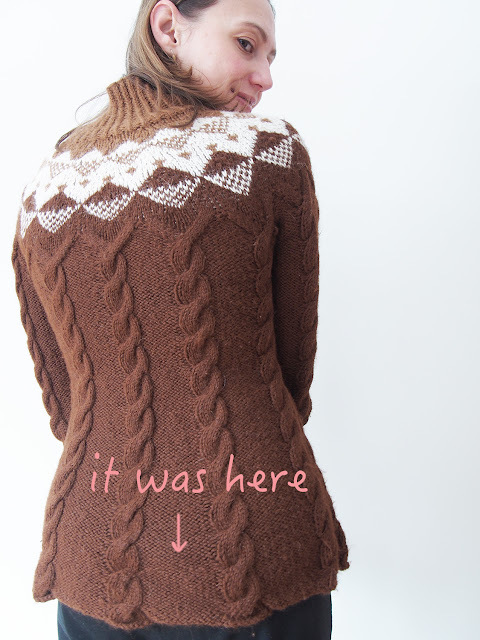 Knits can break in a lot of ways. There's the classic pantyhose pull, where the loop comes out and tightens up stitches to either side of the pull or break. That one's obvious. Then there's the wearing out you see in sock heels and elbows -- that's pretty obvious too, because the yarn is thin along a whole patch surrounding the break. Less obvious might be a bad piece of yarn that you didn't realize was thin or knotted before you had knit it in. In that case, you should see just one break and 2 loose ends. But this? This was at least 3 breaks in a row, all 6 pieces graced with jagged edging. This, my frightened friends, was an insect attack. So not to size, if only! Think 1/8" and infuriatingly invisible. While I'd love a nail polish in either of these colorful coats, I'd like these critters to stay the #$%@ away from my closet!!! Working as a developmental biologist, I learned some important insect facts from colleagues working on the model organism Drosophila melanogaster, a.k.a. the fruit fly. 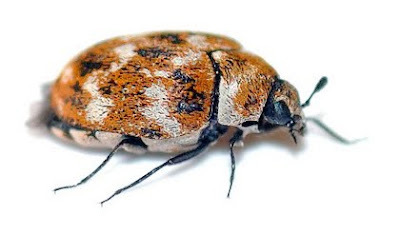 It isn't adult insects that are eating your wool, it's the larvae, and larvae are evolutionarily HONED TO LIVE. You can actually freeze eggs and certain stages of larvae and they will survive the thaw and develop normally. What they can almost never do is survive TWO THAWS. 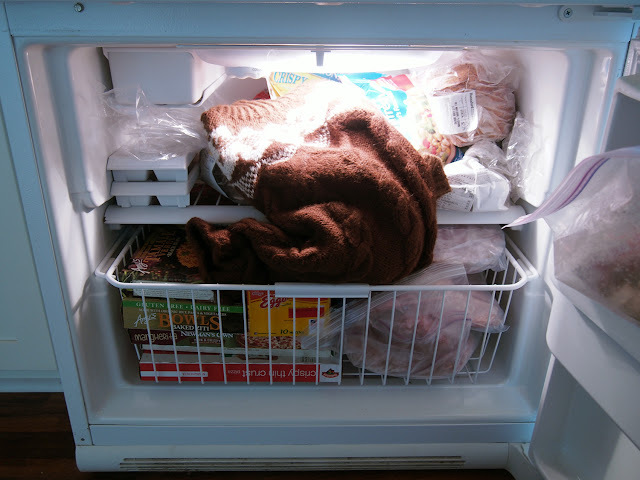 STEP #1: Stuff your knit in the freezer. If you are lucky enough to have god-forsaken winters like me, put your knit outside when it falls below freezing temperatures. 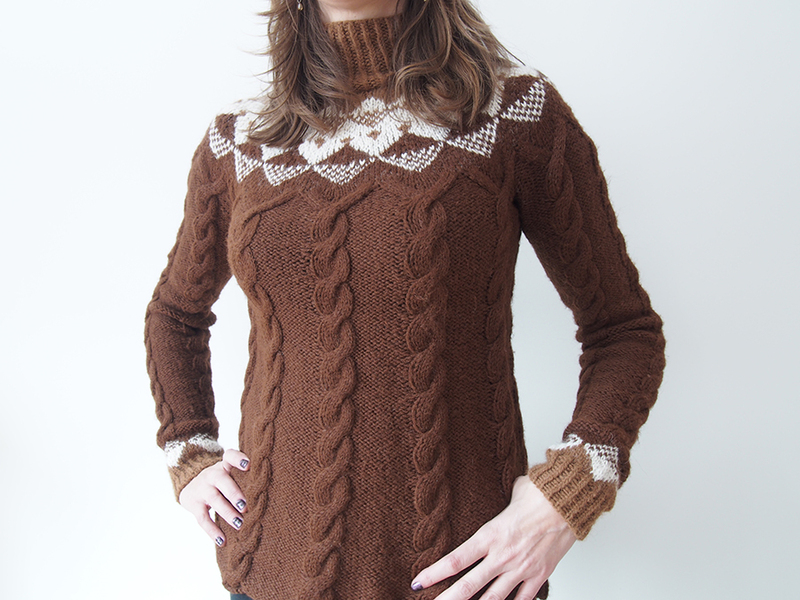 Better yet, lay it on some snow overnight to freshen and clean the knit, a la Scandinavia. I went all the way and removed every.single.woolen.item from my closet, stuffed them into bags and condemned them to the garage overnight. STEP #2: Move to room temperature overnight for a good thaw. STEP #3: Repeat once more! I highly suggest you do this with any wool you bring into your home. Anytime I go to a thrift shop, I throw my yarn and clothes twice into the freezer before storing. If you buy a wool rug, especially if it's an antique, keep it outside in your garage for two freeze/thaws. I can't say when my trouble occurred as I don't use this knit very often. WORD TO THE WISE: USE YOUR KNITS. 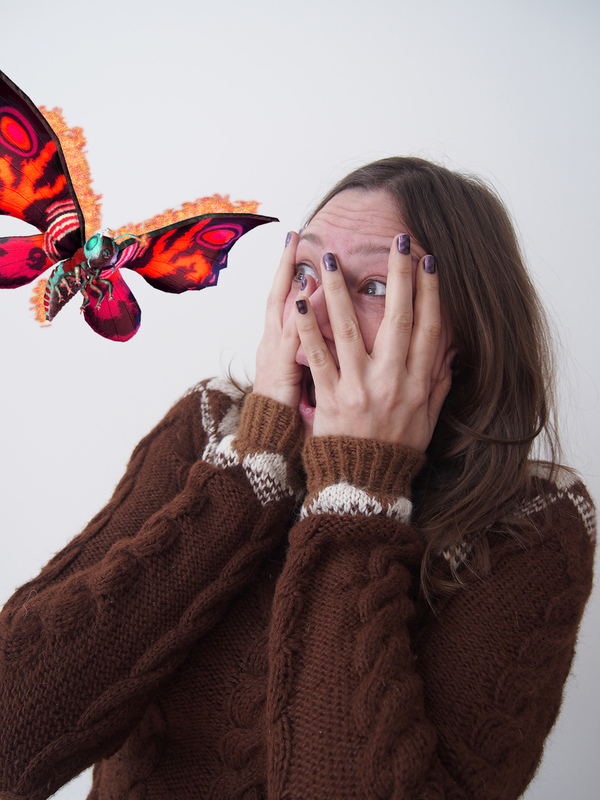 If you wear a knit, it's way less likely to accumulate bugs, they hate the light and the movement. Ok, the goal was clear, to get back to this intact beauty. First, look at the anatomy of the hole. This is a good metaphor, because you are basically opening it up and preparing it for open heart surgery. Find all the stitch loops you can and catch them onto yarn or locking stitch markers. Then pin out all of the strands to see what is required. 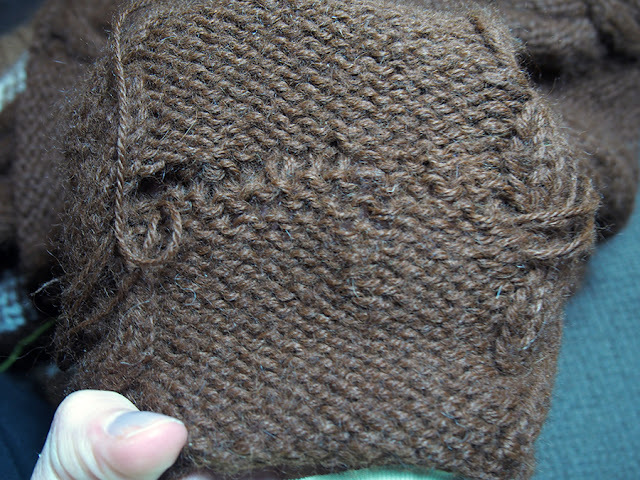 I had 4 live stitches on the top and the bottom, and 3 broken rows. To fix the knitting so it looked perfect, I needed to treat the live stitches like dropped stitches. 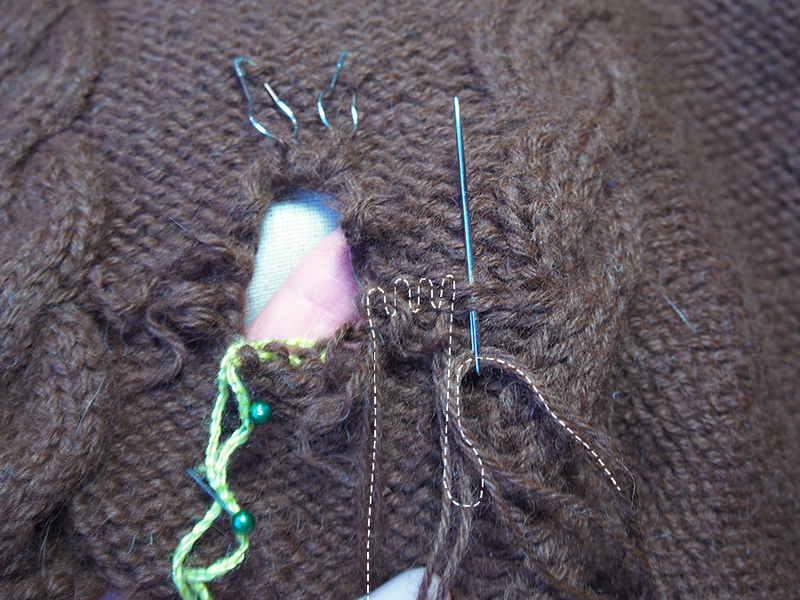 To pick up a dropped stitch over many rows, you take a crochet hook and loop up the horizontal ladder above the stitch. I wanted to do the same thing, but my insect friends had decided that the ladder would make a nice snack. 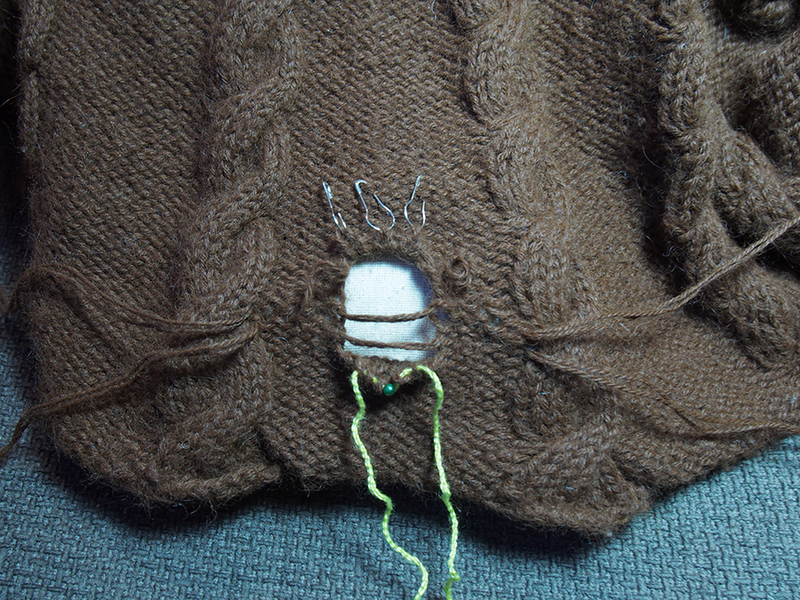 To put it back I threaded a needle with the original yarn (ALWAYS SAVE SOME YARN FROM YOUR KNIT SWEATERS!!) and simply traced from the break through the row for about 2 inches. You will basically be looping up and down through the row above and below. 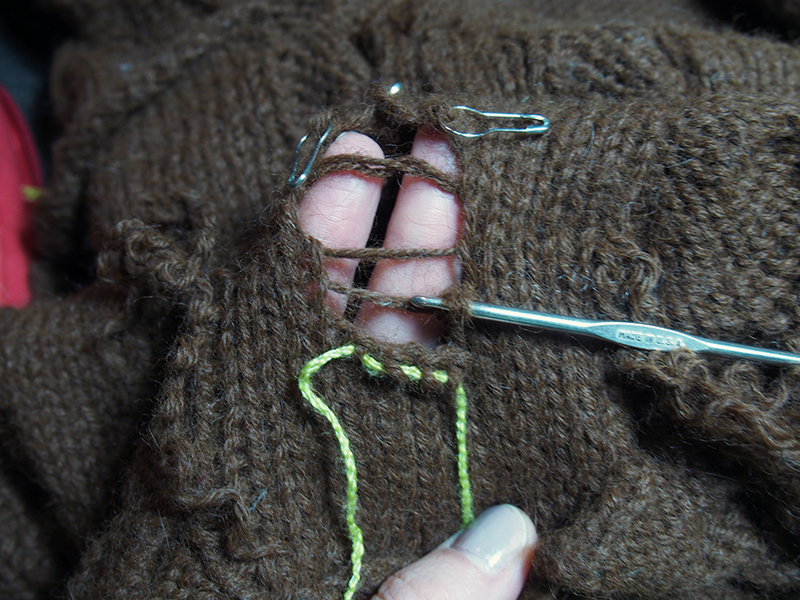 Start with one side, leaving enough excess to pick up the other end of the yarn for the other side of the hole. Here's what it looks like after tracing 2 of the 3 rows! ... 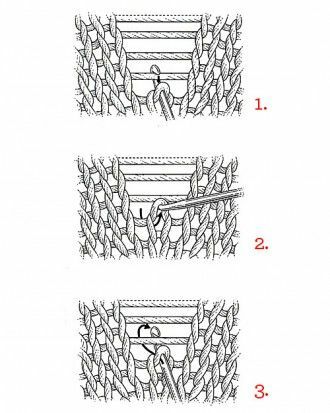 IF YOU WANT PERFECTION, to attach those stitches to the live stitches above, you need to embroider or kitchener them to the live stitches from below. The crochet hook will not get you there. To do this properly, ONLY WEAVE ONE SIDE OF THE LAST LADDER. Then use the other end of the last ladder for kitchener or embroidering along the loops. ... tighten them up along each row. I found it easier to do on the stockinette side. 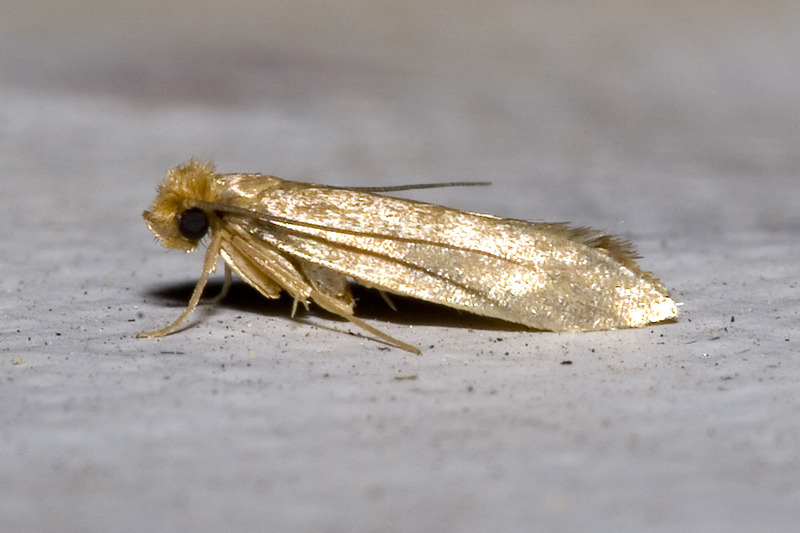 And I WAS SAVED FROM MY MOTH ATTACK!! 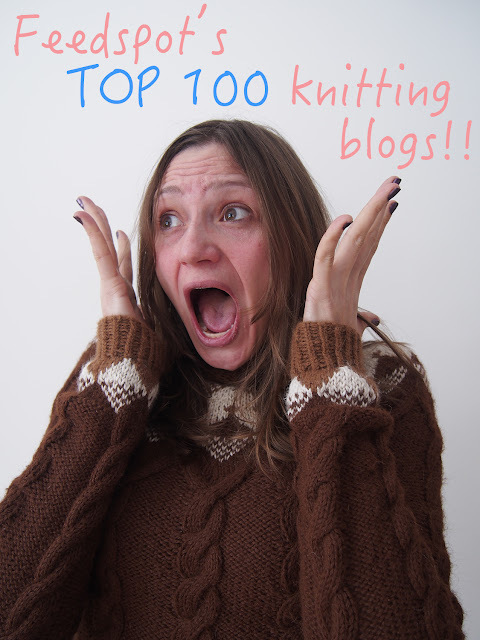 Just a little bit of good news today: my blog was featured on Feedspot's Top 100 Knitting Blogs! THANK YOU GUYS FOR ALWAYS COMING BY. <3 Yeah, I'm just as dramatic when I'm happy. This is SO timely, as I just found a moth hole in one of my long-unworn sweaters! I was going to google how to fix it and then your post popped up on my feed! 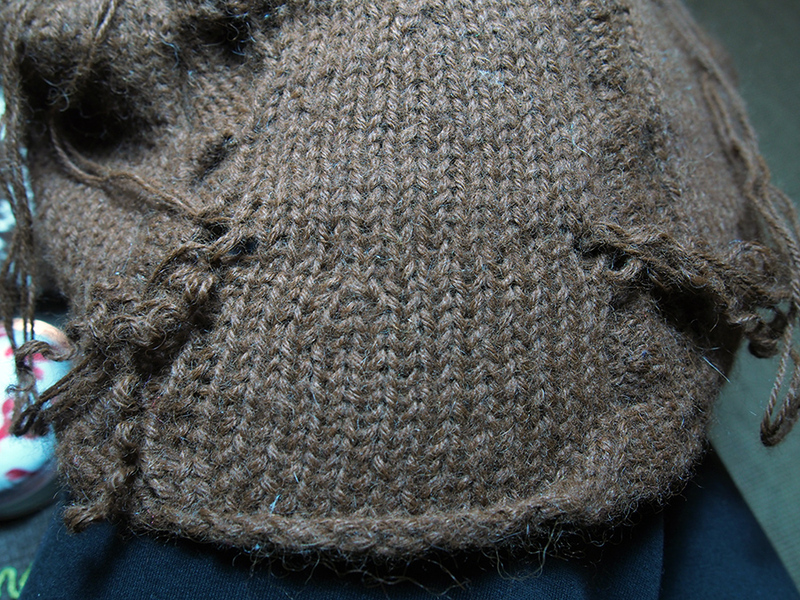 It's not as big if a hole but much thicker yarn (cascade Eco+) and the hole is right in front so I'll have to do some creative weaving so the places where the yarn is doubled aren't as obvious. Ugh!! This will teach us to leave them in the closet, hey? Don't forget that you can unpick the old yarn so there is no doubled yarn thickness at any point. Of course, you will have to weave in the old ends and the new ones right in the front, but if it's thick yarn and you do it loosely, you might not see anything at all. I just washed and blocked a bunch of knits that had been languishing and found a hole in a little cardigan I knit for one of my twins. I realized I hadn't been very good about freezing my thrifted finds lately. 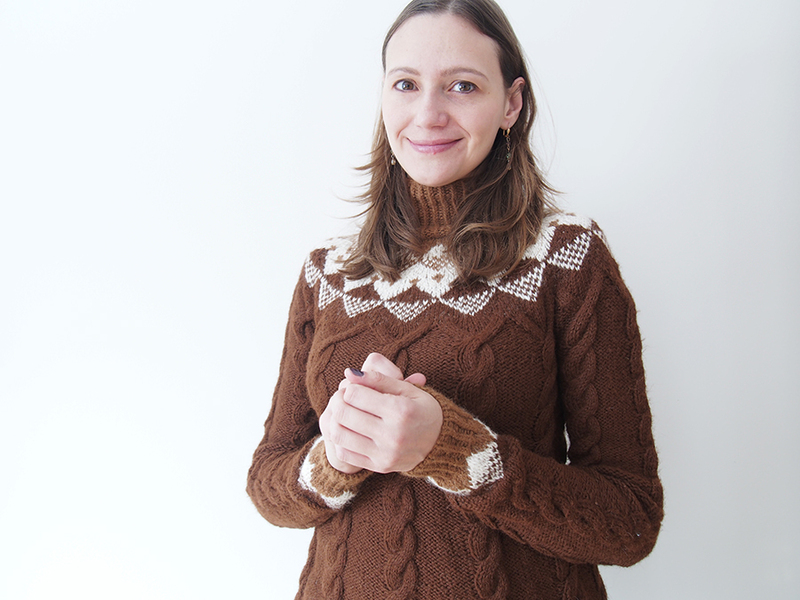 I buy a lot of cashmere and wool sweaters, both to wear and to unravel and reknit. We recently moved and haven't yet filled our small chest freezer, so I plugged it in and am going to rotate all my wool, sweaters, and handknits through it until they've all been frozen and thawed twice! Not taking any more chances! We live in North Carolina so (fortunately? Unfortunately?) we don't always get many nights that are below freezing around here! I just had to throw out a lace shawl that had been languishing for a while in a cupboard, there's no fixing lace once it's been thoroughly munched unfortunately! I've been doing a good job in buying anti moth dodads to put in wardrobes and drawers ever since. Hey, Dayana, could I send you a picture of a slipper? I made a pair for my grandpa for Christmas 2014, and the other day I went over to their house and I saw them and offered to put some non-slip grips on them. When I got them out, however, I found that one of them had two holes in it. I don't know if it's moth holes or mouse holes; I looked really closely at the slipper and couldn't find any moth eggs or anything, but something has definitely munched them (the holes aren't from being worn; my grandpa said he hasn't worn them much). 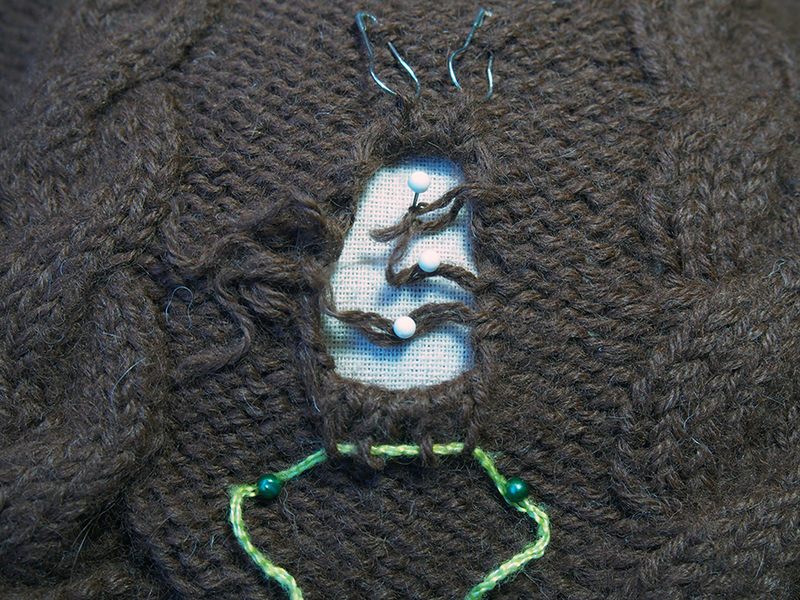 I can't tell if they look like the hole in your sweater or not, but reading it made me kind of freak out because, thinking they weren't moth holes, I've got the slippers in a locker with some other knitted stuff. I'll do a separate comment with my email so that I can send you the picture; and you can either delete it or not approve it, whichever (if you don't mind me emailing you, of course!). Hi Laura, I don't think we managed to connect on this! Write to dayanak@gmail and send me the picture if you still have it! That is a really professional repair. The sweater is beautiful so it was well worth the effort. Anyway , simply Genius !!!!!!! Thanks for this post. 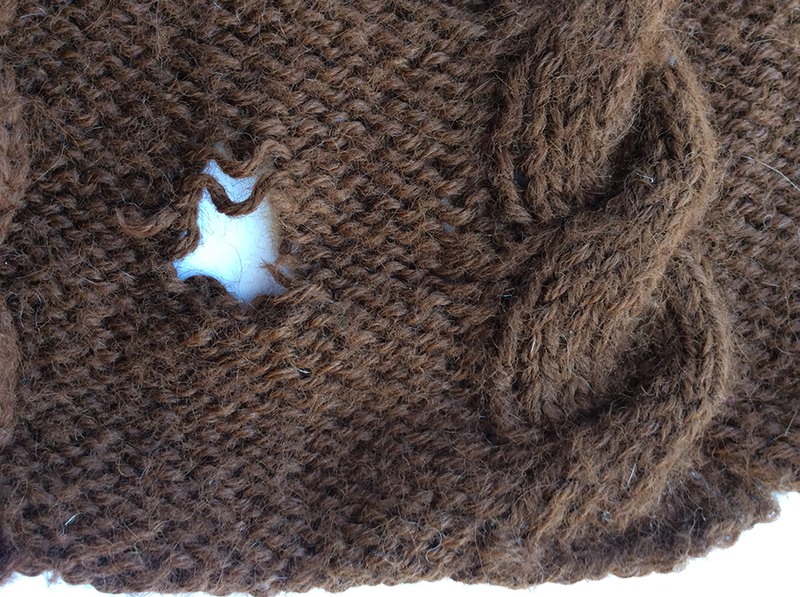 I've never had to try to mend a sweater hole, but I'm saving this for the day that I might need to do it. 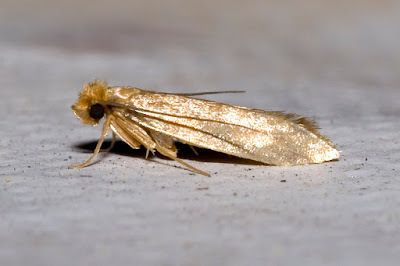 I store my wool sweaters in a cedar chest and my closet floor is cedar lined -- that seems to prevent moths, but who knows. Ok I'm jealous. Well, they've used cedar since the very beginning, so I am sure there is something to it! Though I do hear that you should re-oil your chest/closets once in awhile with cedar oil. Sorry for this ridiculously old reply, I've been delinquent. On that note, I'm just about to publish a giveaway of the book Refined Knits, so hopefully you'll see it! That was badass! Looking at it, it is barely noticeable that there actually was a gaping hole in it. thanks for the tips. Very helpful. Repair looks amazing! My beautiful poncho has many moth holes to repair. It's worth saving. Thanks for your tips. I'll just do one hole at a time.